A lot can be discerned in moments of downtime, or at least that’s the way Greg Fisher sees it. 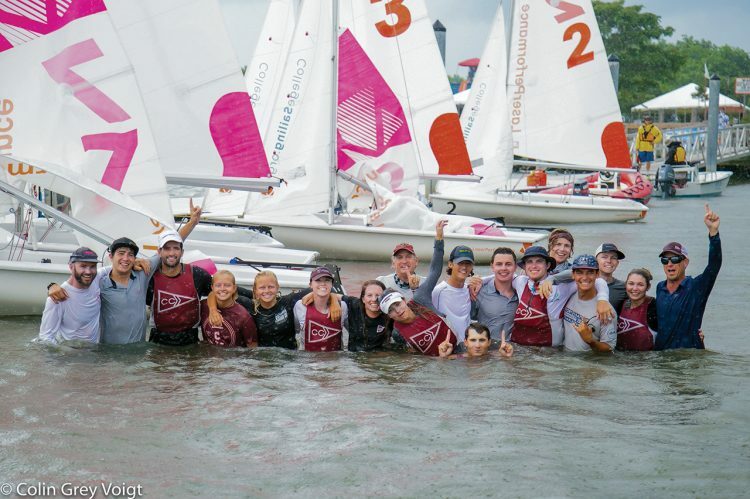 Though he resigned as director of the College’s sailing program last summer (to take on a new role as chief operating officer of the U.S. Olympic Sailing Team), Fisher was on hand last spring when his Cougar argonauts vanquished the competition at the 2018 LaserPerformance Team Race National Championship regatta – one of three national championships staged on the James River at Old Dominion University in Norfolk, Va.
During a break in the competition, Fisher wandered around the little shoreside base his team had set up under a couple of tents. Two of his three top skippers – College Sailor of the Year Stefano Peschiera ’18 and Christophe Killian ’18 – stood in the shade eagerly sharing team-racing strategies with head coach Ward Cromwell. The third, Augie Dale, was relaxing nearby, casually strumming away on his acoustic guitar. Elsewhere, teammates were lounging, laughing, sharing stories and simply recharging. Then came the team race regatta, a three-day affair that also went down to the wire. The Cougars needed to win the final contest against Hobart and William Smith Colleges to successfully defend their 2017 title. In that final race, Peschiera and his crew, Grace McCarthy ’18, approached the finish line just behind a rival boat. 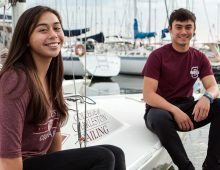 Nearby, Killian and his crew, Elizabeth Pemberton, sat in fourth place with Dale and his crew, Katherine Loundsbury, in fifth. 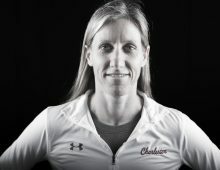 In the final seconds, Dale and Loundsbury accelerated across the line to seize second place, meaning the Cougars placed 2, 3 and 5 to their rival’s 1, 4 and 6 – a sure victory in this complex and demanding discipline. The following day, it was time for the culminating event, the Gill Coed National Championship. In modest winds, the Cougars had an uncharacteristically mediocre start, but steadily improved throughout the three days of competition. Though they finished well – securing second place against 17 other teams – no team could unseat the squad from MIT. Ultimately, the Cougars were awarded the Leonard B. Fowle Trophy – for the eighth time – signifying overall supremacy in collegiate sailing. It was definitely a moment to savor.